Below is one of the many hand drawn flyers I created to promote the band back around 1993. This ancient flyer features my original design/sketch for the Bal-Sagoth logo which I drew in 1989/1990. Witness the evolution of the “Sublime Macrocosmic Malevolence” t-shirt/zip hood design from early draft to completed illustration. Artwork by Maggot Meister. Here’s the original rough sketch of the cover for “Starfire Burning…” which artist Joe Petagno sent to me for approval back in 1996. 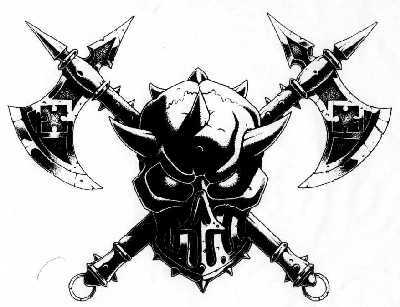 Full colour painting of the skull & axes “Sigil of War” icon. This is one of the rough sketches of the cover artwork to “The Power Cosmic”, which Martin Hanford sent me for approval back in 1998. 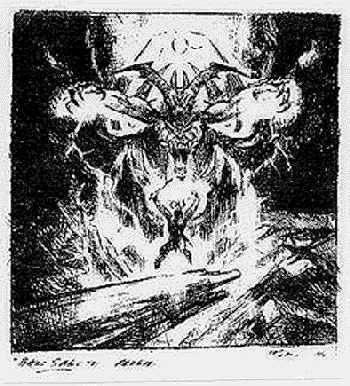 Below is one of the rough sketches for the “Atlantis Ascendant” album cover sent to me by Martin Hanford in 2000. Here’s the original rough sketch by Martin Hanford for the classic “The Crows Will Pick Your Bones Clean” warrior shirt and flag. 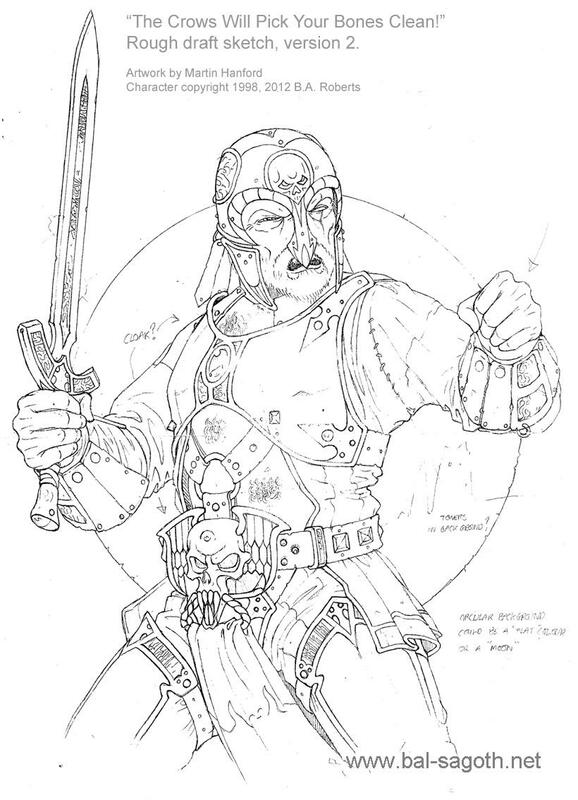 This draft of the preliminary illustration does not feature the shield which appeared in the final version, because at this stage in the design’s evolution Martin was considering having a bird of prey, such as a hawk or a falcon, perched on the character’s hand. Ultimately, Martin and I decided to go with a shield. 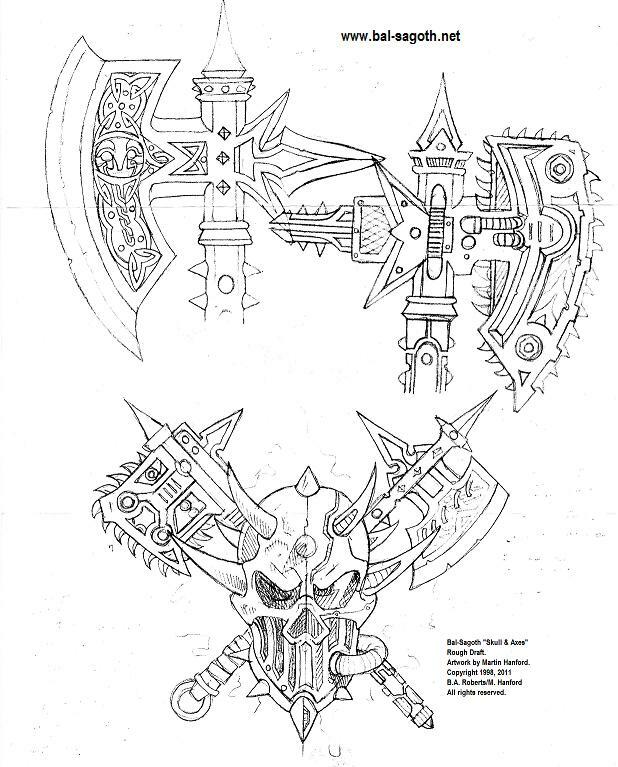 The final version of the artwork appears below the sketch. Below is the rough illustration for the “Future Era Caylen-Tor” design by Martin Hanford, which appeared on the classic “Bow, Yield, Kneel” shirt and also in the digipak re-release of “The Power Cosmic”. I asked Martin to add a helmet to the character, and he sent me illustrations of several brilliant helmet designs to choose from. The final lupine helmet design was chosen to reflect Caylen-Tor’s status as “The Wolf of the North”. The finished version of the artwork, painted on a watercolour board, appears below the preliminary sketch. These images represent the evolution of the primary cover artwork for the “Apocryphal Tales” CD and vinyl release and the “Cthulhu Fhtagn” t-shirt. Artwork by Martin Hanford. 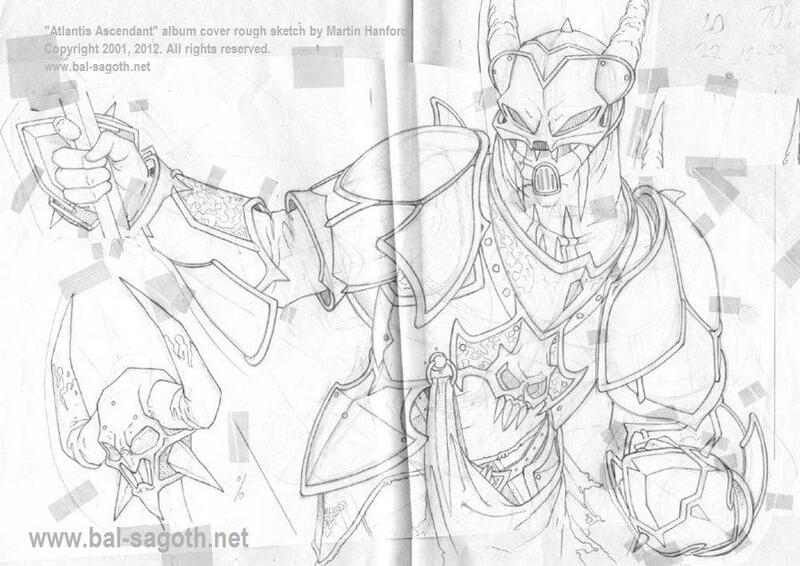 More artefacts from the Bal-Sagoth Artwork Archives soon! Will there be any further BAL-SAGOTH albums? There are currently no plans for any further Bal-Sagoth albums, at least not for the immediately foreseeable future. That’s not to say there’s any shortage of inspiration or material… far from it! I have the content prepared for albums 7, 8 and 9, including lyrics, titles and even the cover artwork. That material has existed for years, and includes the final chapters to all of the stories which were left unfinished on the existing albums. But now is not the time. Perhaps one day… if the stars align. How did the band start? This question has been asked so many times over the years, so here’s the definitive version for the archives! Here you will find out about the origin of both the concept and the band itself. I came up with the idea and concept for Bal-Sagoth many years ago (around 1989), and had tried unsuccessfully to start it up with a succession of different musicians. Unfortunately, it was the era of socially aware thrash metal, and nobody was at all interested in committing to a fantasy oriented black/death metal project. I was determined to start the project however, and continued my attempts to find musicians who might be interested in the idea. Then, a guy I knew called Mac, who had played guitar in a prominent local thrash band called Systematic Insanity, asked me if I wanted to jam with some guys he’d met. They were only playing Metallica and Napalm Death covers in their bedroom (in an old manor house which had once been a lunatic asylum), but they were interested in starting a serious band. So, I went and met the Maudling brothers Jonny and Chris (Jonny Maudling had previously been in a thrash band called Igniter, playing the regional pubs and clubs) and also Jason Porter, and we jammed some stuff. Unfortunately however, I really wasn’t interested in playing the kind of material that they were into, so I figured it just wasn’t going to work out. Jonny and Chris weren’t at all familiar with black metal, and also Mac didn’t like the fantasy/mythology concept I had in mind for the band, or the name “Bal-Sagoth”. Mac wanted to do a sort of thrash/death metal band with contemporary socio-political lyrical topics. He was also, at that time, somewhat horrified at the suggestion of a metal band with full keyboards. I figured I might as well keep jamming with Mac until I found someone else with whom to start Bal-Sagoth, so we called the non-serious bedroom outfit “Dusk” and continued to spend Sunday afternoons making a horrific noise. Well, this went on for a few months, but absolutely nothing came of it. I wasn’t happy that I couldn’t implement the Bal-Sagoth concept fully, and Jonny and Chris also confided in me that they too weren’t happy with the kind of material which we were playing as Dusk. Then, for a variety of reasons, we parted company with Mac (but ironically, Mac would later re-join us on bass). At that point, I explained to Jonny and Chris in detail the kind of music I wanted to do, and gave them a rundown of the Bal-Sagoth concept, saying that keyboards would ideally play a prominent role in such a band. Back then, I kept all the lyrics, logos, and ideas in a large black folder, which I showed them to give them a firm idea of the whole concept behind the band. They thought it was all pretty weird, but Jonny, who was a trained pianist, was very intrigued by the idea of keyboards, and when I showed them material by black metal bands such as Emperor, they were sold. 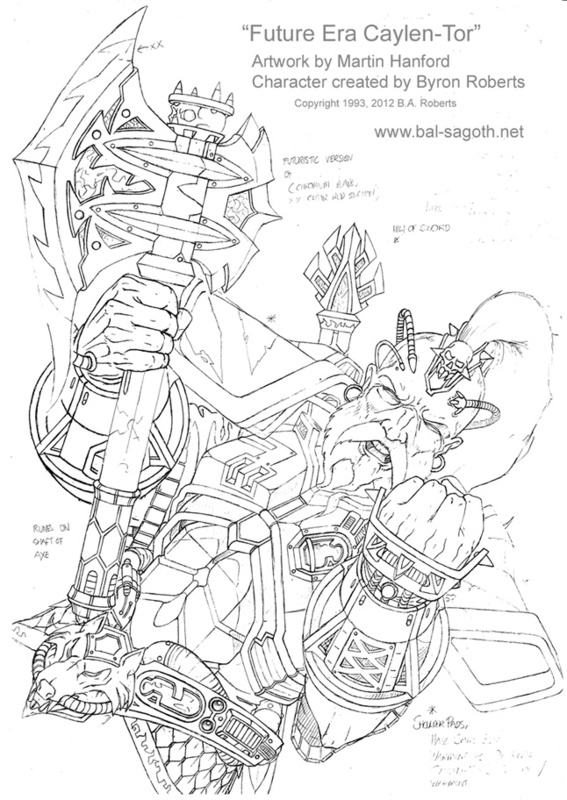 And so, Bal-Sagoth was formally implemented during the summer of 1993. We still had Jason on bass guitar, and for keyboards we recruited Vincent, and we began crafting the music which would ultimately end up on our demo and later on the debut album. And that’s how the band started. Why doesn’t Bal-Sagoth play many gigs? It is very difficult to recreate this material accurately in the live environment. The music of Bal-Sagoth is so multi-layered and intricate that there is really no way in which we can genuinely translate the songs live to a truly satisfactory extent. Some of the other guys in the band are okay with this constant compromise in their desire to continually play shows, but it has always vexed me, particularly when we attempt to play the more complex songs. Additionally, I have always felt that when a band plays live, much of the magic and the mystique which is contained on an album is generally lost. No matter how good the show might be, the very act of playing live often demystifies a band and brings them back down to a mundane and earthly level; such are the limitations of the technology and the very medium itself. I’d also like to add that it takes a lot of preparation and logistical planning for us to undertake shows. Rehearsals have to be arranged, transport has to be coordinated and band members have to take time off from work. The low gig fees and shirt sales from shows often simply do not make all that expenditure worthwhile. Additionally, we don’t have our own sound man, so we are constantly forced to rely on the sound engineers available at whatever venue we might be playing, and those sound engineers invariably have no idea as to what this band should sound like in the live environment. Even if we’re afforded a thorough sound check during which to educate the sound men as to the band’s nature, the levels and monitor mixes always end up wildly incorrect. All in all, the live realm is certainly not the ideal platform from which to showcase the artistic vision of Bal-Sagoth. So basically, those are the reasons why this band doesn’t play live very often. I call the process by which Bal-Sagoth composes songs the “synergy” method, as that’s the best way to describe it. The lyrics are always written well in advance of the music being composed. However, the other members often don’t get to see the actual lyrics until well after the fact. It’s always a surprise to them to actually find out what the final lyrics are. It was different in the early days, when I showed all the lyrics to the members from day one and often demanded certain riffs be written specifically to suit certain lyrical passages. These days I prefer not to do that. Instead, I always prepare a general conceptual synopsis concerning the narrative outline of the album which I then give to Jonny as a reference. This synopsis includes information on which stories will be included on the album, what the required themes and moods should be, the general emotional essence a piece should convey, etc. Sometimes the details I give him are very sketchy, which Jonny often prefers so as to not overtly colour his music writing, while other times the synopsis is quite detailed. An example of the synopsis being followed well is the song “The Fallen Kingdoms of the Abyssal Plain”, for which I told Jonny that I needed a piece which conveyed the feeling of a journey to the bottom of the ocean, down through the various levels of the marine depths, to the very sea floor where we would see the ruins of ancient non-human underwater cities. I was very pleased with how well that one reflected the synopsis. In the case of epic centre-piece songs such as the second chapter in the Obsidian Crown saga or the Hyperborean Empire cycle, the synopsis will include much greater information, such as a broad outline of the events in the actual story, the key occurrences, what kind of music is required for a certain event, etc. We find this method generally works best. More often than not Jonny will just write something completely unconnected to any outline and present that to me, too. This is often how it works, but it varies. The process of refining and perfecting a composition then proceeds over a period of weeks and months, with any number of different versions of a song exchanged as MP3s, until everything ultimately comes together in the recording studio. And that’s the Bal-Sagoth way of writing songs. Wasn’t the Circus Maximus used just for chariot racing? But you have gladiatorial combat taking place there in “Blood Slakes The Sand At the Circus Maximus”. The Circus Maximus was very much an “all purpose” arena. Although it is perhaps best known for the epic chariot races, many different events were in fact held there, including parades, beast hunts, plays, recitals, athletics, religious ceremonies, gladiatorial contests and horse racing. Isn’t “chthonic” pronounced wrong on the album “The Chthonic Chronicles”? Sure, the “ch” is technically silent, but I chose to pronounce it as “katonic” for a couple of reasons. First, I liked the alliterative qualities which the “hard c” sound afforded when paired with the word “chronicles”, which neatly paralleled the alliteration of the previous Bal-Sagoth album title “Atlantis Ascendant”. Second, I always liked the Lovecraftian connotation which the “katonic” pronunciation suggested. So, although he is technically wrong about the pronunciation, I always rather liked that theory and the phonetic link to HPL which it afforded. So, that’s why I decided to use the “katonic” pronunciation. The personal recollections of Byron Roberts on the recording of Bal-Sagoth’s works. BYRON: We recorded the demo during a single afternoon in a small recording studio under a curry house. We could only afford to book in for a few hours, and we recorded three songs during that time. We never officially released it because it was never officially finished. We always intended to go back and add a few more vocal parts and a few more keyboard parts (making them sound less like a stylophone), and to remix the whole affair. However, we never got round to it and ultimately I started releasing the tracks into the underground tape trading community (this was in the days before MP3s and file sharing). The tracks on the demo included a very early version of “Dreaming Of Atlantean Spires”, a song called “By The Blaze Of The Fire Jewels” (which later underwent a lyrical and musical overhaul and became “Shadows ‘Neath The Black Pyramid”), and a song called “A Shadow On The Mist”, which we broke up for spares, using some of its riffs in other songs. The “true” version of the demo includes an intro which I took from the movie “Masters Of The Universe” and also some BBC radiophonic workshop sound effects from the classic “Death & Horror” tape. These tracks were raw, brutal, rough, and totally incomplete, and they only hinted at the greatness that was to come. Nevertheless, they got us a three album deal with Cacophonous, so they ultimately served their purpose. I authorized two of the tracks to be included as bonus tracks on the Japanese sub-licensed version of our fifth album “Atlantis Ascendant”. The demo will soon be released as a limited edition CD with additional tracks and a lyric booklet! BYRON: Our first full length album! We had about two weeks in Academy Music Studio to record this, during the midsummer of 1994. The archaic glory of analogue recording equipment! Needless to say, things were very hectic, and time was short. We of course ended up running out of recording tracks, and lots of stuff was therefore recorded on the same tracks, which resulted in a lot of fun, and slider carnage, during the final mix. I don’t think Cacophonous knew what to expect from us with this album. They initially wanted us to wait a while before recording a full opus, but I was adamant that we were ready to go ahead and record a full LP. A good studio and a fair budget duly enabled us to show the world exactly what our take on extreme metal was all about, and what the Bal-Sagoth mandate truly was. The Bal-Sagoth lyrical mythos officially began with this album, and the genesis of many of the hexalogy’s epic tales was here. Angsaar! 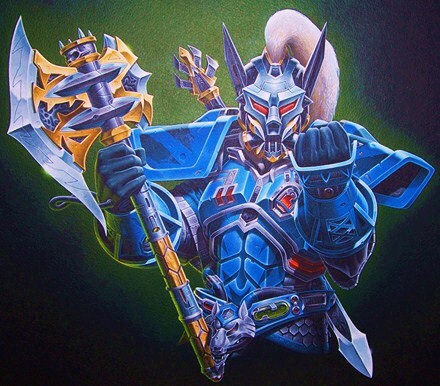 Khthon! The Shadow-Sword! Legendary sound engineer Mags helmed this one, so beginning his long and glorious association with the band. A few interesting snippets of first album trivia: We heard that COF were quite pissed off that we were recording at Academy because they were allegedly worried we would steal their keyboard sound. Ha! Well, needless to say we proved with this album that we were pretty serious about our keyboards. Also, the guitar solo on “The Ravening” was played by John Piras, who at that time was in Solstice, and who later went on to be in COF. Mags also played a bit of guitar here and there on this album, and also on the next one, as it happened. And finally, the album intro was composed and played by Keith Appleton, the owner of Academy Music Studio. I’d been telling Jonny for ages that we needed a keyboard intro for this album, but of course when the time arrived, nothing had been composed. So, Keith came to the rescue by giving us a piece he’d created some years earlier, which was in reality part of a musical suite for a stage production of Alice In Wonderland, but which had been rejected because it was too scary and would have freaked out the kids. Also, this album remains the first and only Bal-Sagoth opus to have been released as a vinyl LP edition (although the vinyl version omits the track “The Ravening”). This album hit the metal scene like a set of adamantium claws through the chest. Only when this ferociously dark and brutally baroque work landed on the doorstep of Cacophonous did they realize the true power of the mighty Bal-Sagoth. (Still didn’t stop them taking almost a whole year to release the album, though.) Bal-Sagoth had arrived. BYRON: Back to Academy during another sweltering summer for the second album. Everything about this album was bigger and more epic, from the music to the song titles! Forget pan & scan, this was the anamorphic version of Bal-Sagoth. Just over two weeks in Academy, which was nowhere near long enough, but that was all the label would spring for. Also, they wouldn’t even foot the bill for new 2 inch reels, so we actually had to use the same reels as before and record over the first album! Unforgivable. Anyway, the temperature in the studio reached such crazy levels that the recording equipment actually broke down on several occasions. But we battled on, secure in the knowledge that we were creating something special. Elaborate orchestrations, intricate vocals, symphonic keyboards… this one really pushed the envelope and proved once again that the power and the glory of Bal-Sagoth was truly unparalleled. The cover art was painted by the famous Petagno. The lyric booklet was huge for its time, and contained the most elaborate lyrics yet seen. The saga of Bal-Sagoth truly continued with this album, and fan favourite stories like the Hyperborean Empire saga, the Obsidian Crown saga, and the Darkenhold mythos began here. We spent a long time writing this album, and it was sublimely epic in scope. Up against the clock, we pulled out all the stops and used every trick in the book to get this one completed on time, including playing a lot of the double bass drums on the keyboards (yes, you read that right). This album also featured a CDROM track, which in truth was little more than an ad for the Cacophonous roster of the time. (For some reason, it was also placed at the beginning of the album, which meant that when played in a normal CD player, the first track on the album was a fascinating journey into silence.) Dark, epic, icy, gloriously sinister and bombastic. Many consider this album something of a metal milestone. Which is fine by us. BYRON: And lo, the fourth album! The first one for Nuclear Blast! A new record label! A new cover artist! A new drummer! A new bassist! Lots of changes here. A grand return to the hallowed halls of Academy Music Studio for the fourth chapter in the Bal-Sagoth saga. This album was the first one on which Jonny did not play drums and Chris did not play bass. A searingly clear production (some would rightly argue too clear) and a decidedly less barbaric approach to the musical compositions meant that the fourth album was perhaps quite markedly different in sound from previous chapters, substituting much of the trademark Bal-Sagoth chaos and extremity for a more refined and crystalized soundscape. Nevertheless, this was still undeniably Bal-Sagoth. This album was the first during which the more science-fiction oriented aspects of the lyrics (heavily hinted at during the previous releases) finally came more to the fore. 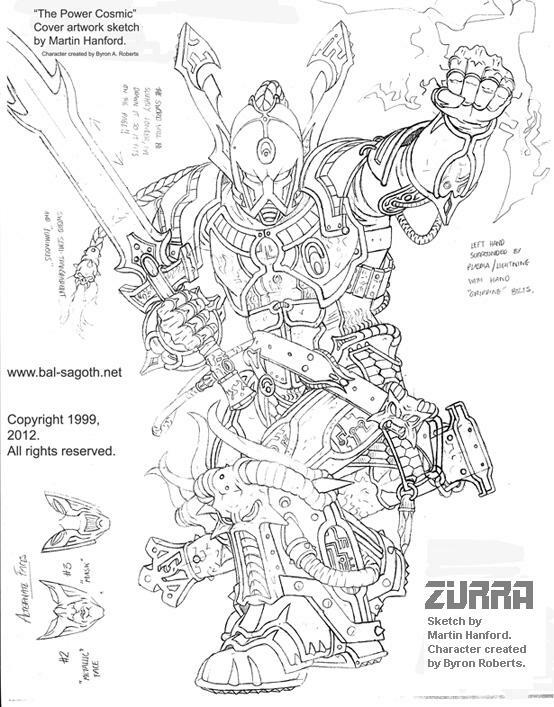 The millennia-spanning saga of the evil arch-fiend Zurra and the fabled Empyreal Lexicon was unleashed upon the legions of Bal-Sagoth fandom. Controversially, this album, for the first time, did not include a full lyric booklet, something which incensed many long term fans of the band’s stories. 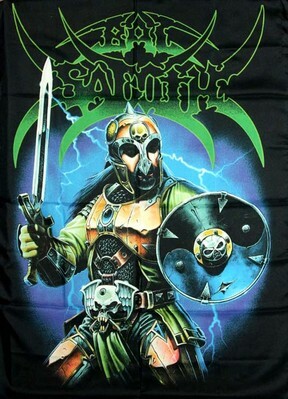 The lyrics, as intended, were ultimately released as a downloadable exclusive at the Official Bal-Sagoth Website, and later included with the Russian sub-licensed edition of the album. And at long last, there’s a new expanded version of the lyric booklet included with the recent digipack reissue of The Power Cosmic! Boasting a glorious cover by artist Martin Hanford, “The Power Cosmic” went on to become the biggest selling instalment in the entire saga, which was at least partly attributable to the massive promotional push which NB gave the opus (seriously, I must have done something like 200 interviews with magazines and radio stations all over the world to promote this album. NB certainly had a massive promotional engine). Fourth album trivia: During the recording of “The Power Cosmic”, the band’s iconic sword Excalibur was stolen from the studio by local street urchins who proceeded to sell it, presumably in order to buy rocks of crack. Fearing the righteous wrath of the mighty Bal-Sagoth, various lowlife scum swiftly gave up the sacred blade, and it was ultimately returned to us, after having passed through at least one pawn shop and several worried owners. BYRON: The fifth album! Once more into the fray! Once more into the haunted labyrinthine chambers of the Academy! This album marked the first tentative steps on the path of digital recording, as Academy had begun to upgrade and replace its analogue equipment with some new digital apparatus. New vistas opened up before the band’s collective creative eye, and the digital age dawned in the kingdom of Bal-Sagoth. Continuing the long established tradition of elaborate and intricate orchestration, the fifth album was a multilayered, multi-textured exercise in dark and epic art. Mixing elements of all the previous chapters, “Atlantis Ascendant” struck a fine balance between extremity, clarity, aggression and refinement. Lyrically, the baroque saga of Bal-Sagoth continued, with the Hyperborean Empire trilogy reaching its climactic finale, and the exploits of archaeologist and adventurer Professor Caleb Blackthorne III making their debut, setting the scene for many of the events on the sixth album. Fan favourite songs such as Draconis Albionensis and The Dreamer In The Catacombs Of Ur were unleashed upon the world, and the band’s artistic palette expanded with a myriad vibrant musical and literary colours. Overall one of the most consistent, complete and most successfully realized of the Bal-Sagoth albums, “Atlantis Ascendant”, resplendent with its glorious artwork, further fortified the band’s undeniable legend. The fifth album provided the supporters of Bal-Sagoth with plenty to reflect upon, which was particularly important when you realize it would be a full five years until the appearance of chapter six! Fifth album trivia: “Atlantis Ascendant” was the last album to be recorded at the old premises of Academy Music Studio. As we were putting the finishing touches to the album, the studio was being disassembled around us. We even took some of Academy home with us, for old times’ sake. BYRON: Patience is a virtue. All good things come to he who waits. Better late than never. The sixth album took so long because someone decided it would be a great idea if we recorded it on the band’s own digital equipment, in the band’s own digital studio. That was in 2002. Over the years, the slow and onerous process of amassing all the required equipment dragged on, and on. And on. Deadlines were set. And ignored. The clock kept ticking. Several years, numerous fights, and a few catastrophic hardware failures later, we were ready to begin to consider the possibility of recording the sixth album. Gradually, the music took shape. The lyrics had of course been written years before, and it was vital that the music for this, the climax of the hexalogy, reflect the thematic nature of the stories to the letter, stories such as the siege of Gul-Kothoth, the Catacombs of Ur prequel, the great sub-aquatic voyage to the Abyssal Plain, and the all important reprise of Hatheg-Kla. The music was adhering to the detailed story outlines and the synopsis I had presented to keyboardist Jonny, and the compositions were progressing gloriously, if very laboriously. More deadlines were set, and more deadlines slipped. Tensions were running high. More songs were slowly nearing completion. The mysterious new studio, “Wayland’s Forge”, reached its ultimate evolutionary form. Everything was digital. We had fully embraced the future, for good or ill. Equipment was upgraded, parts were re-recorded. And yet true progress was still painfully slow. Keyboardist Jonny had asked to handle sound engineering duties for this most ambitious of projects, and as it was his first truly major foray into such territories, it was very much a voyage of discovery. The amount of time this album took to record strained band relations to the limit, and they remain strained to this day. But finally, in November of 2005 it was time to put the finishing touches to the album with a vocal session at the new Academy Music Studio. Partly due to tradition, and partly due to the fact that only Mags understands my idiosyncratic and highly specialized vocal approach, I decided to return to Academy for the vocals. Then, in December 2005 we started on the final mix. I’d commissioned the cover artwork from Martin Hanford three years previously, and it had been locked away in my vault for all that time, waiting in the dark for the day of its unveiling. Finally, that day was drawing near. This one went right to the wire, with us mixing all the way up until the day the courier was scheduled to arrive. The album had to be completed. It had to be despatched. I had to take it and package it for the UPS courier, otherwise Nuclear Blast were threatening a release date delayed by up to a year. The Death Star had cleared the planet. “The Chthonic Chronicles”, as I promised the world several years before its release, was an album darker and heavier than much of our previous work, encompassing elements from all the preceding five chapters as well as containing a plethora of new and exciting touches to thrill the listener. Truly organic sounding choirs, utterly genuine symphonic effects and unparalleled orchestral grandeur, thunderously heavy guitars and venomous vocals. Lyrically, the climactic and most malefic chapter in the entire saga, featuring both long awaited continuations of old stories and some all new tales, all set within the conceptual framework of a shunned, blasphemous and apocryphal occult grimoire. This wasn’t just the climax of five years of work, in a way it was the climax of thirteen years of work. Luckily, the world embraced “The Chthonic Chronicles” fully. Upon release, the sixth album received some of the very best and most glowing reviews of any of our works, and we finally, at long last, allowed ourselves to believe that the job was done. Thanks for listening and reading! Blodu Ok Jarna! Hail to the best band in the universe!! Myriad triumphant adulation for the mighty Bal-Sagoth! SIX SCORE AND TEN OBLATIONS TO THE MALEFIC AVATAR OF SUBLIMELY CTHONIC WICKEDNESS KNOWN AS BAL SAGOTH! BLODU OK JARNA!!! Hail Lord Byron! You and the others of Bal-Sagoth are the very backbone of all music in the world! You are the greatest metal band ever been formed and my personal favorite(including more mainstream bands such as Drowning Pool, Three Days Grace and Five Finger Death Punch. All because of the rich lyrical flavor those bands and your music have to offer!). Your a great inspiration for my own ideas, both musical and downwritten(short-stories). For me you are the most epic metal band in the world, no one can deny that. First of all, your narration through all of your songs are most tasteful and mostly passionate, it gives me a “soul-recharger” so to speak, refills all of my energy. I hope your coming up with a new album soon, for I am waiting for some new and fresh material from you 😀 I can’t wait. Thanks for been both a great inspiration of my own works and for been a life-saver! 🙂 And I’m also hope you and the others will come to Sweden sometime in the future. 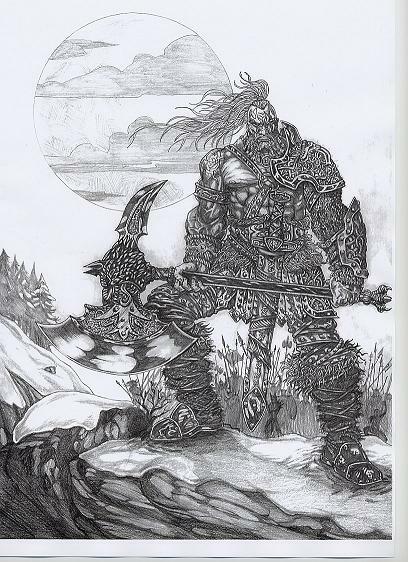 когда же вы что-нибудь наваяете.или здох bal sagoth совсем.жалко если так.очень даже хорошо у вас получалось!!!!!! Hey, Byron! It is time make some fresh stuff! In the early days of mine I found Bal-Sagoth and it guided me in every step, inspiring with a vigour and bringing the hope. Great music for the great men! To be honest, I found no one compared to Bal-Sagoth in its epic feel (except Basil Poledours’ soundtrack for Conan, of course;)! I want to propose to make some music stuff (I am the music producer specializing in cinematinc orchestrations) together! Please, listen to my two themes “Forging the Celestial Battle Axe” and “Legend of the Venus Fall”. They are very close to your style (because inspired with:)! Hail Byron. How goes thy world? Due to circumstances beyond my control, I am not dead! Rumours be scotched and purgatory descend upon all scandal-mongers! All this talk of re-issues, in expanded formats….. What about some new storytelling, with more gleaming broadswords and ice thrones? This is me telling you to get up off your arse, like I would do, as you well know. When the time is right, we will return.